Charming 1B/1ba Casita/Condo, just 50 Steps to Ocean in South Mission Beach! The next best thing to Ocean front, this super charming casita/condo is just one house back from the OCEAN in South Mission Beach! Located just 50 STEPS from the Ocean, in SOUTH MISSION BEACH, what we consider to be the most tranquil and family- friendly part of Mission Beach! Yet close enough (just a 5-10 minute walk up the boardwalk) to all the excitement of the restaurants, bars, and amusement park of Central Mission Beach! One of three condominium units we rent in a four-unit building, this one-bedroom, one-bath casita/condo is a cozy home for 2-4, and makes a perfect location from which to base your San Diego getaway, or just tuck in for a romantic retreat. Mexican tile and Spanish decor provide indoor charm, while your own PRIVATE PATIO and barbeque provide wonderful outdoor living space -- great for dining, reading, relaxing. This large but cozy private patio opens onto the Mexican courtyard, where you are just 50 steps to the beach! A two minute walk takes you south to the jetty. A five minute walk takes you across Mission Blvd to Mission Bay, or to the Grassy Park and Picnic area, with children’s swings and playground equipment! And again, a 5-10 minute walk north takes you into central Mission beach where lots of shops, restaurants, as well as The Wave House and Belmont (Amusement) Parks are located. This unit features all the comforts of home including full kitchen and all cooking/dining utensils, bed linens and bath towels. You’ll also have beach towels, boogie boards, sand toys, beach chairs and umbrella to fully enjoy the beach fun! Even FOUR BEACH CRUISERS for use by our guests! In addition to miles of lovely coastline of beach and bay boardwalks right outside your door, you are within walking/biking distance of pubs, dining, entertainment, parks and local attractions (like Belmont amusement Park, The Wave House). When you’re ready to see more of San Diego, you are just minutes from most of San Diego's greatest attractions such as Sea World, Old Town, the downtown Gaslamp Quarter, Qualcomm Stadium (Chargers), Petco Park (Padres), Balboa Park, the world famous San Diego Zoo, great shopping, and so much more. Please check our website (see link below) for more information including availability. Thanks to the kids' grandparents who treated us...we stayed here years ago when our children were ages 2, 4, and 6 -- now they are teenagers and still loving the place! The location is ideal! We love being so close to the ocean (50 steps away), but also enjoy the privacy of the being one house back from the boardwalk. We also adore the outdoor patios (why be indoors when it is 75 degrees most of the year?) where we can enjoy meals, read, do crafts and play boardgames and relax outdoors. New is great, but we love the old charm and charisma of and this spanish style buiding and courtyard! The upstairs 3B/2ba, and 2B/1ba are perfect when friends and grandparents want to join us -- all together, but each family has their own space. Perfect! Hope you'll come visit and make great memories for your family! We chose this place, because we stayed here years ago and fell in love with the charm, the location, the proximity to the beach! We love South Mission Beach. It seems quieter and more family friendly than central and North Mission. When we want peace and quiet we hang out here. When we want to see a little more excitement and people watching, we walk five or ten minutes up to Central Mission to The Wave House, Belmont Park area or to check out shops and restaurants. At night one of our favorite things to do is to hop on the bikes and head to Saskas or Bear Back Grill! Nothing like the seeing the glistening moonlight on the ocean, and hearing the sound of the waves as we bike back home along the boardwalk! Our home is just 50 steps from the Oceanfront boardwalk - there is literally just one ocean front home in front of ours - the next best thing to Ocean front - and way more budget friendly! Sheets & Blankets for Queen in Master, and sofa sleeper in living room. coin operated commercial washer & dryer in laundry room, behind casita/condo. 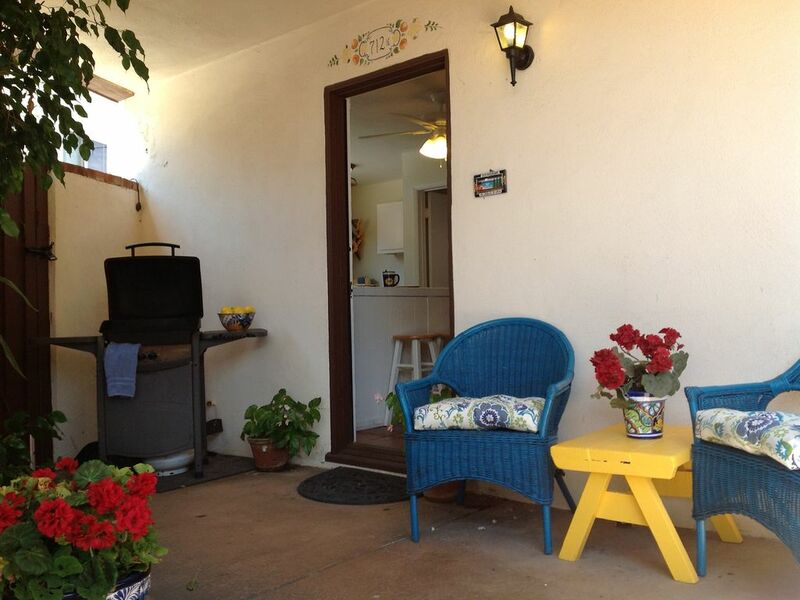 Large Shady Private Patio with Patio Table and Chairs - outdoor dining for 6! Cute little apartment for 1-2 people in a great location. Clean and well equipped with everything one could want. Single car garage parking -- a must for South Mission Beach. Laundry facilities on site. Julie was a real pleasure to work with, very attentive and kind. Thank you, Julie! Thank you so much, We'd love to have you back any time! Cute and clean, with everything you need, and only steps to beach and bay. Julie was very friendly and the apartment was very cute. It was clean and comfortable. Great location right on the boardwalk!! Stayed here over 4th of July weekend enjoyed it very much nice lower-level unit, very clean full kitchen super location right on the boardwalk short bike ride to Belmont Park. There are bicycles and Beach supplies that are supplied by the owner so we enjoyed many bike rides on the boardwalk. All in all a great place definitely would stay there again!! Thanks so much for staying with us, and for taking the time to leave a nice review! I'm so glad you perceived it as being right on the boardwalk, but just don't want to mislead anyone...its not quite right on the boardwalk, but just one house back. Again, one house closer, and we would be right on the boardwalk, but that means you would have to pay ocean front prices, lol. This is the next best thing! This is a charming property ideal for 1-2 people. We found it to be very clean and having everything needed to make our vacation enjoyable. There were a few minor repairs needed, that when we told the owner, she had a handyman there right away to make plans to correct them. The owners are very helpful and accommodating. I can't think of any ways they could've made our vacation experience any better. We would definitely recommend this property. Cathy, thank you so much for staying as our guests, and taking the time to leave us a nice review! Yes, our home is comfortable, cute, but nothing fancy... but with an outdoor shaded private patio, and in an ideal location - it is the next best thing to Oceanfront, truly! Just 50 steps from our courtyard and you are on the oceanfront boardwalk! Thanks again, Cathy! We are so glad you enjoyed your stay! I had the pleasure of renting this property long term as I finished school in San Diego. The property is located on a quiet street in South Mission Beach, less than 50 steps from the sand. The area is quiet, but walking distance to Belmont Park and various bars and restaurants. The house has everything you need to enjoy the beach! There are bikes, beach chairs, boogie boards and sand toys made available by Julie, the owner of the property. There is a nice table directly out the front door that seats 6 people and a BBQ. Cooking at the house is easy and there are a few local grocery stores within walking distance as well as a Ralph's and Vons less than a 10 minute drive away. The owner includes one garage spot which makes having a car a breeze in San Diego. The garage is large enough to fit a Cadillac Escalade or minivan. I also had no trouble finding parking spots on the street for guests (be observant of the various street sweeping signs and rules, SD parking enforcement makes a lot of money over the summer). Daily walks on the beach are a must! Not many visitors are aware of South Mission Beach so there are usually open fire pits, volleyball nets and prime spots on the beach. I watched many sunsets with less than 10 people in sight. The condo is easy to clean and manage and very comfortable. There is a closet in the bedroom that fits a good amount of clothes and hangers are provided. The decor throughout is very charming. There is a washer and dryer on the property which made doing laundry easy! I highly recommend staying at this property. Julie is very welcoming and attentive, should a problem arise. The property is in the best location in Mission Beach and Pacific Beach as well and provides all the amenities you could ask for. Nice little bungalow and great location. Clean. Beautiful patio. All the accommodations and toys needed for a fun beach trip. Owner Julie was very attentive to anything we needed. I would recommend and stay again. Here in quiet, family friendly South Mission Beach, you will be lulled to sleep by sounds of the Pacific Ocean - toes in the sand just 50 steps from courtyard gate! Yet you are just a ten minute walk from the lively fun of central Mission Beach with Belmont Park, The Wave House, shops, restaurants, and lots of fun people watching. The Bay is just a five minute walk away, and it provides lovely grass picnic areas, playground, and from the Channel, you can watch the beautiful sailboats and other craft heading in or out to sea!